Sunseeker International is delighted to announce the launch of its brand new website, which reflects this iconic global leading luxury brands’ products and ethos. The site, www.sunseeker.com, features fresh imagery and content and utilises the very latest technology to enhance the viewing experience for customers, wherever they are in the world. Fully responsive and latest browser ready, the website intuitively adapts to whatever device is being used, including tablet, mobile or desktop, allowing customers to browse easily and conveniently. The website showcases a wealth of new content including improved yacht information, updated brand history and heritage, news from across the business, as well as lifestyle features including destination-inspired editorial from the quarterly Sunseeker magazine. The new array of imagery features the entire range of stunning motor yachts in beautiful locations across the globe, shot by some of the world’s most talented photographers. Visitors to the website will notice the use of a fresh colour palette, in keeping with Sunseeker’s new brand identity. This is a landmark that signals an exciting new age for Sunseeker. Another stand-out feature of the new website is the addition of a translation platform, which will be introduced in the coming weeks. 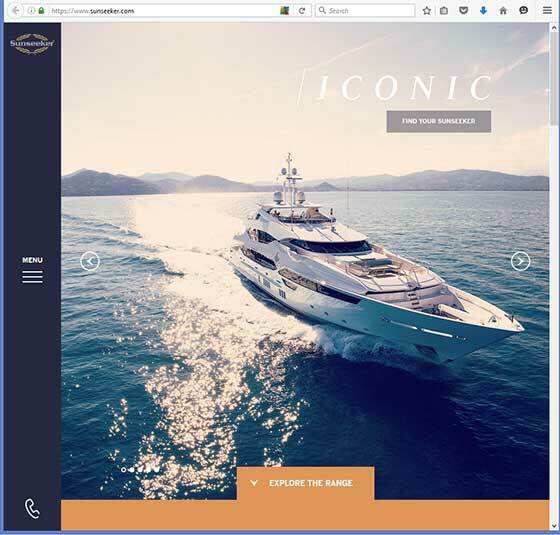 This feature will transform the site into a multi-lingual website with a total of eight languages available for visitors, created with Sunseeker’s diverse and far-reaching customer base in mind.